So I haven't posted in a week. Sorry. I haven't really been motivated. I'm still fighting the lingerings of a cold and that with staying busy just makes me mentally drained and unmotivated to write anything. So today's post will be a bunch of randomness. Last night a few girlfriends and I went to one of our fave wine night events, Wine & Design. However, this time we weren't painting - we were gluing. Wine & Design in Mt. Pleasant tried out a new 'craft' last night. They purchased a ton of old windows from the Habitat for Humanity store. Then we took the colored, clear craft marbles you can get at like Michaels and created a design on our windows. Most of us opted for Palmetto Trees, but others did crabs, fish or other fun 'Charlestony' (yes, that's a word) designs. It was surprisingly easy and something I think we could definitely do on our own. I really loved the way that mine turned out. They also had other materials we could use like sea shells, sand, glass tiles and beach glass, which I used for my Palmetto Moon. It was hard to get a good picture of it. I want to try and figure out how to hang this somewhere so it catches sunlight through it. Not sure how I'm going to do it, but I would love the hang this out on our back deck or fence somehow. The glue we used is super strong and weather resistant. Wine & Design told us they plan to do this again next month, so keep an eye out if you're interested. So, if you've been following my blog for a while now, you know how obsessed I am with Old Navy's Rock Star jeggings. Well, I was super excited when they recently came out with Rock Star Jegging capris! 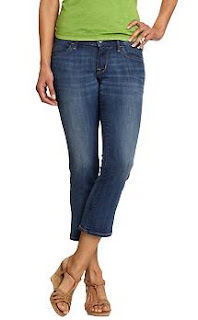 I'm the same size (went up lots of sizes as usual) in them as I am in the jeans and they are perfect for work, running errands, catching a movie, etc. As a shorty, I roll up the bottoms about two inches to form a cuff. Super comfy. Hooray. 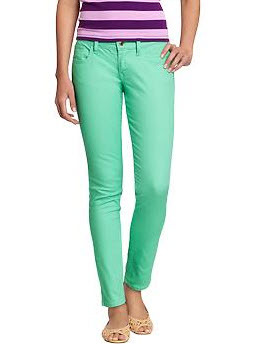 I was also excited (my wallet, not so much) to find the Rock Star colored jeans in a new minty blue color! I snagged a pair online before they sold out in my size... they will be a nice addition to my pink, purple and green pairs. Yes, I may have a colored jean problem...but they get lots of wear out of them, I promise.... Hmm, I'm thinking my wardrobe may soon resemble Rainbow Row. Today during lunch I ventured out to find some nice picture frames. I first stopped at Ross For Less thinking they'd have a selection like you could find at Marshalls and TJ Maxx...negative. They had barely any picture frames and they were all crappy. 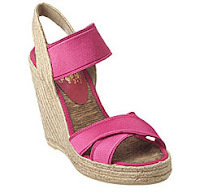 I did, however, walk out with (I paid for them of course) these adorable Nine West pink and straw wedge sandals for only $25! I love them! So I went next door to Target assuming they'd have some higher end picture frame options. Not really. I ended up getting a few frames at Target that were just ok in my opinion...but I also walked out with a new bandeau bathing suit top and a bathing suit cover up as well. Stupid Target trap! It could have been much worse though. I purposely avoided certain aisles because I knew it could be trouble. Has anyone tried the One-a-Day Vita Gummies? I recently read about someone taking them and loving them. I definitely need to take a daily multivitamin, but have struggled in the past with the typical One-a-Day capsules. Not only are they enormous and I hate feeling them all the way down my throat and in my stomach - but they always, always made me nauseous....even when I would take them after a big meal. So as a fan of fruit snacks, I thought the gummy vitamins might be a nice alternative to try. I just took my first 'dose' of them about an hour ago...so far, no nausea. They do have 10 calories and 3g of sugar...but that's nothing, right? Adorable wedges! I need to try on those rockstar jeans! I love love LOVE my rockstar jeggings! 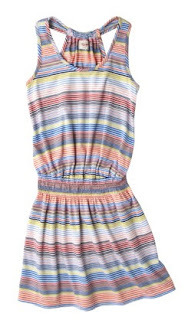 I didn't know they had the mint green ones--so pretty for summer!